Whether it is misleading the Parliament of Australia, cutting its workers’ wages, paying zero tax while racking up $33 billion in sales, sending gas prices into the stratosphere or dudding the poor people of Papua New Guinea, Exxon has flair. They are also masters of intrigue. You won’t find the financial reports for ExxonMobil Australia on its website, you won’t even find the names of the directors, despite the enormity of this operation. You certainly won’t find their photographs without googling madly and paying for company searches. You absolutely won’t find mention of the 585 entities Exxon has in the Bahamas, or a for that matter, any breakdown of related tax haven associations. How is it that this, the biggest of the US oil majors, a corporation which has been making fabulous profits in Australia for fifty years, can pay zero income tax? How does it skin its taxable income in this country back to zero? The Esso/BHP Billiton joint venture drilled Australia’s first offshore well in 1965 when it discovered the Barracouta gas field in Bass Strait. Two years later Kingfish was found, the first offshore oil field, which to this day remains the largest oil field ever discovered in Australia. How is it that with record, eye-watering gas prices, that Exxon pays no income tax? Its financial statements provide a few clues: massive “debt-loading” – its Australian companies borrow billions of dollars from other Exxon companies overseas and funnel hundreds of millions of dollars offshore via interest payments on the loans. And finally they’ve been pinged for it. Its 2018 financial report discloses that the Tax Office has been investigating Exxon’s related party loans and has busted them for being slippery, issuing amended income tax assessments for the 2010 and 2011 years. Exxon menacingly notes it might sue the Tax Office, as it continues to “negotiate” over what it claims is fair pricing on its inter-company loans. These fighting words are typical of a bullying multinational oil giant. 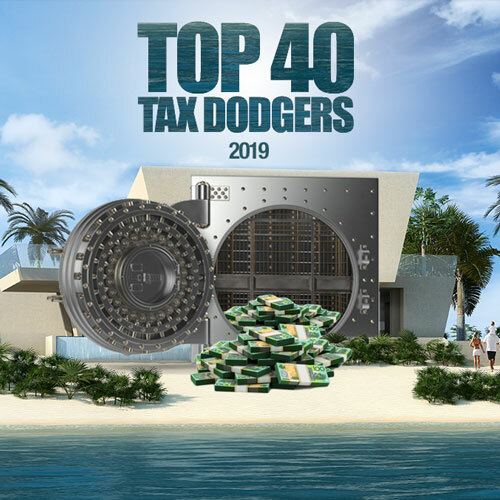 Yet it also notes the fight with the ATO has implications for the 2012 to 2017 years and Exxon is acutely aware of what fate befell its peer, Chevron, which muscled up to the ATO and lost an historic court case, for pretty much the same sort of rort – aggressive “transfer pricing of money”. Post the four-year ATO tax transparency figures, Exxon’s latest financial statements show more of the same. Thanks to spiking gas prices, cashflow jumped from $8.2 to $11.3 billion in one year. Profits though were wiped out by Exxon’s massive related party debt. It is this monster debt which is the oil major’s main weapon of tax avoidance: some $1.8 billion in finance charges over the past two years on debt of $17.6 billion. Tax rose from $341 million to $508 million in 2017. But guess what, not in Australia. This tax booked in the Australian entity, although the accounts don’t specify it, and although Exxon executives refused to be interviewed about it, represents tax paid in other countries, namely Papua New Guinea and Indonesia. Further, they have lobbed in PRRT as income tax when it has the quality of a royalty for extracting non-renewable resources from the seabed. It is the PRRT, an incredibly generous regime of tax incentives which has allowed Exxon to match off the costs of new exploration against the dazzling profits of its established operations – and get away with paying no tax. Meanwhile the debts owed to itself allow Exxon to export its profits along with the gas. Exxon declined to answer specific questions for this story, even about where, which countries, it pays tax. Directors and executives declined to be interviewed. The following statement was issued. The company declined to corroborate its claims. We have made significant contribution to Australia’s economic wellbeing through the reliable supply of energy that helps fuel growth. We have invested A$40 billion in the country. 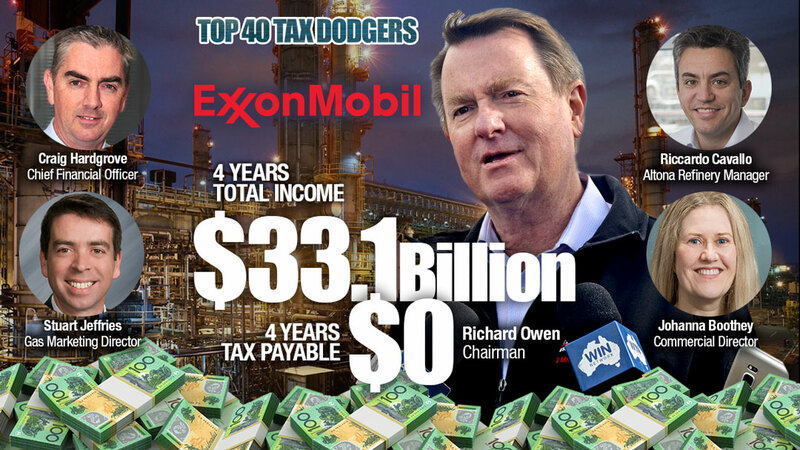 ExxonMobil Australia has a long history of paying its fair share of taxes in Australia, having paid more than A$2 billion in corporate income tax alone since 2000, as well as more than A$13 billion in Petroleum Rent Resource tax since 1990. On average more than $600 million has been paid to the Federal Government each year for over a quarter of a century. With a total investment of more than $21 billion since 2010, of which 85 per cent has been invested over the past six years, we are a substantial investor in the Australian economy and a major contributor to the wealth of the nation.